The major advantage of Future Crusader Day is the ability for incoming freshman to find a niche at NGU they can invest in. Each table provided the opportunity for future students to get a taste of what they can be a part of as incoming freshman. 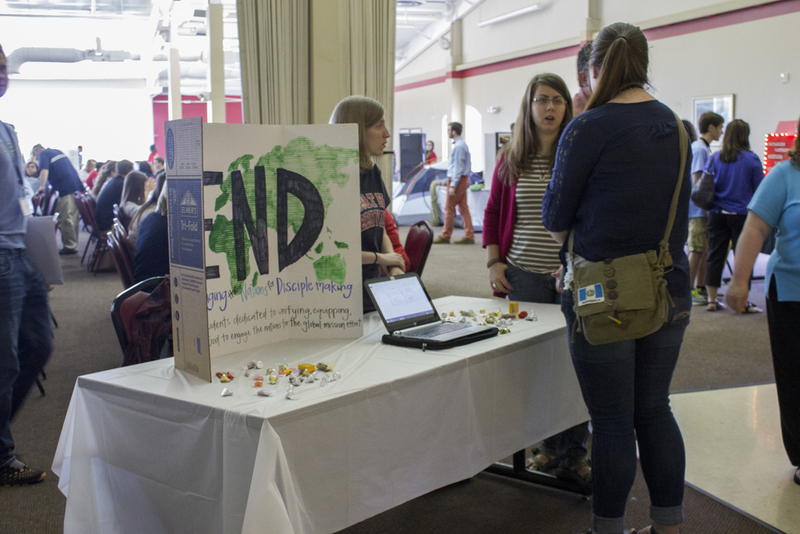 These booths also provided the chance for NGU students to connect with those new students and provide a familiar face for them. Booths provided sign up sheets for future students to put down information they may be interested in. The NGU cheerleaders show their spirit during the Future Crusader Day. Students at the theatre booth explain what theatre has the ability to do at the NGU campus. Some of the heath and wellness majors explain what opportunities they have within their major to those who pass by. NGU student Victoria Pujdak was able to hand out fliers and a NGU magazine to the incoming freshman as a means of connecting them to the online newspaper which provides information of activities that happen on campus. The NGU theatre crew show their well known enthusiasm for those who pass by. NGU biology majors give a thumbs up in regards to their booth. Students working for the Vibe demonstrate how fun the experience is working for the school's radio program. NGU student Katie Gaylean expresses her excitement about the Big-Little Program NGU has for interested incoming freshman. Last Saturday, future crusader got to attend an all day event at North Greenville University called Future Crusader Day. This event allowed high school seniors attending NGU for the coming fall semester to get a good feel for the campus. It also gave them a chance to mingle with other students who will be attending. Upon arrival, students met in Hayes Ministry Center for their placement tests. Afterwards, they gathered in Turner Chapel to become official crusaders. This is also where students first got to meet one another. Meanwhile, in Hayes Ministry Center the school informed the parents about what each student could expect living on campus away from home. Back in Turner Chapel, the campus staff, activities, organizations and clubs were introduced to the students. Immediately following the Turner Chapel session, students broke out into various sessions such as the honors program, teams and ministries, student success, financial aid, athletics, student life, etc. Students got to choose two of these to attend and lunch was provided in between. At 1:30 p.m. students broke into their selective major areas where they were given brief presentations of that selected major. Class schedules were given to students who already registered and completed their necessary paperwork. The students then met back in Turner Chapel for a brief wrap up of the Future Crusader Day and gave away some scholarships. After the giveaways, students and parents either adjourned or stayed for optional tours of the campus.